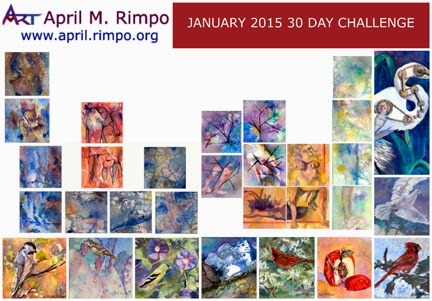 January 31st, 2015 and my first 30 Paintings in 30 Day Challenge is complete. I am proud to say I succeeded at a painting every day and must say it was a great thing to do. I felt liberated to experiment with abstract, steampunk, semi-abstract, and painting over paper I had textured ahead of time. I'm really happy with the results and so glad I have a bag of new tricks to use as I go forward. I've met a number of new artists whom I consider great new friends and I count on staying in touch with you. I am grateful for Leslie Saeta for sponsored the challenge. 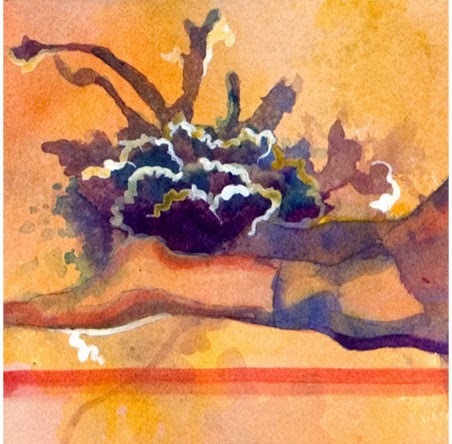 If you want to stay current on my art happenings: new paintings, exhibits, art auctions, and receptions consider joining my newsletter. A couple days ago I was rummaging through the remaining panels I had prepared for the yoga series looking for the right one to use for the cactus wren when I saw this panel and immediately thought of the Alps. This may have happened since I have been looking through old pictures of a trip to Europe recently. One album included some images I had taken of Jungfraujoch from Interlaken, Switzerland. I set aside the panel thinking I'd have to get back to it before I was done with the 30 day challenge. Well here we are on the LAST DAY of the challenge so it is time for The Alps. I wish I had remembered to photograph the panel before I started to transform it. I'd like you to know that I did not add the white snow as that was already there. It was fascinating that when I dug out the photograph and compared it with the panel that the mountains were almost perfect. Uncanny really. I tinted the sky, added the green hill in the foreground, and the brown middle-range cliff. It feels good to have successfully painting 30 paintings in 30 days. I've never been a painting-a-day artist, but the challenge did stretch me and I think I'm a better artist as a result, having some new artistic tools to use. Somehow it felt like a perfect time to experiment and try things out since if it failed all I lost was one day. Thanks to Leslie Saeta for the challenge, to the other artists who commented on my posts, and to friends who joined in on the fun providing me with encouragement. It was a long road for me and I suspect a long road for those of you reading my blog and my Facebook posts. I'm sure I will still do some small one-day paintings scattered among my larger paintings, but the frequency will be much less. I'm anxious to finish a large painting I've been working on for the last week in between all of these little gems. 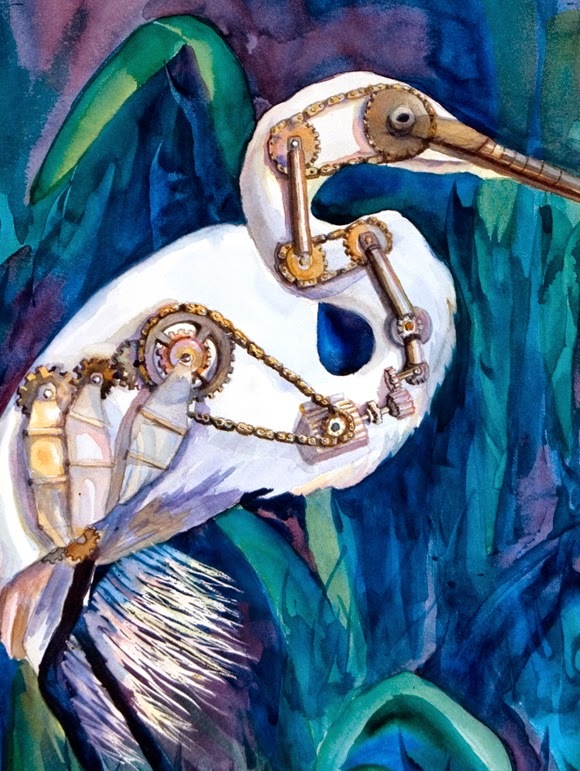 White Crane is a rework of an older painting, originally titled "White Egret", but given its make-over I decided the new title was more appropriate, pun intended. 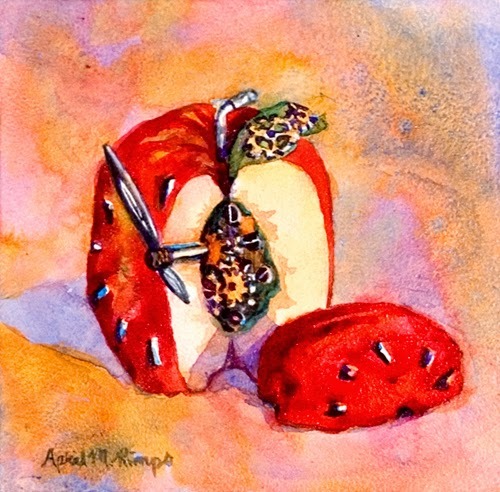 My Apple Clock painting was so fun I decided to take a similar direction. Adding the gears, pistons, and paper wings were not the only changes. While I was at it I added more pastel shades in the shadows and improved the contours of the bird. I think this make-over resulted in a better painting than I had before. If you ever feel you need to do something to improve a painting, don't be afraid to go way out of the box. 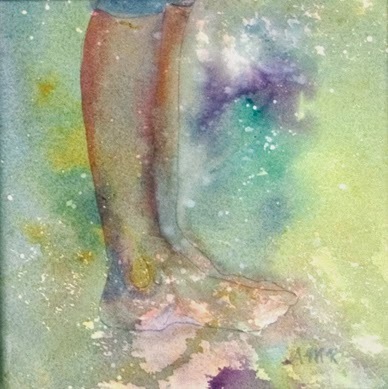 The image above shows the cropped painting after it has been gallery wrapped. The final painting will be 14" X 11" with a 1" gallery wrap depth. It may be hard to believe but I started this painting on one of the indigo gray background sheets I created for the yoga poses. I thought the texture would create a great backdrop on which to start this painting. At left is a photo from an early stage of this painting. I had applied just a small about of blues and yellows to see how the foliage would look on the gray background. 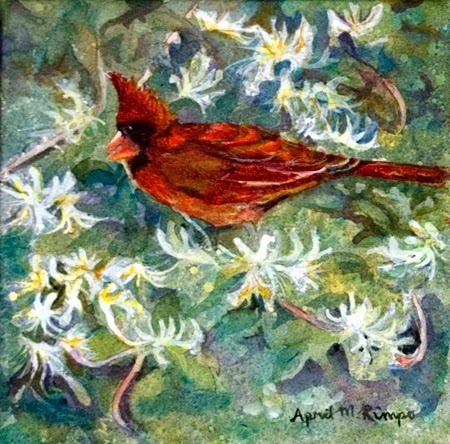 The cardinal was in early stages of development and looked more like a female cardinal than male since I had not yet applied the Permanent Alizarin Red. My family lived in Arizona for a number of years. We loved cactus blooms and wanted to save water in the desert so our front yard and parts of the back were desert-scaped. Among the plants were prickly pear cactus and saguaro. The cactus wren like both, tending to build their nests in the saguaro but perching (and no doubt eating) on the prickly pears. It was fun to watch the cactus wren since their dramatic white and black feathers on their otherwise tan bodies really were beautiful, especially in flight. The prickly pear plant is multi-hued and their fruit turned from green buds to hot pink and eventually matures to a beautiful reddish-purple fruit. One year I made prickly pear jelly from the fruit. It was good but boy a lot of work. The plants themselves vary from pale greens to lovely shades of lavender. When we visited friends in Arizona last year I had the opportunity to photograph some beautiful young prickly pear plants and cactus wrens perched on saguaros. I combined them in this painting as a tribute to memories of a wonderful trip and a great time visiting friends. I find the Steampunk trend interesting in the combination of mechanical parts with everyday objects. Sometimes animals are transformed to made of mechanical parts such as gears and pulleys and engines and sometimes clothing on figures has a mechanical component. Figuring out how to combine gears and pipes into an apple was a challenging experiment. I was an electrical engineer before becoming a full time artist so I have some drafting skills, but I am not a mechanical engineer, so I am sure my clock would not function. I was determined to make the gears fit into the core of the apple and have a few elements that looked a bit like seeds. It took quite a while working on a drawing while gallery sitting at a coop to which I belong. I played with a variety of angles on the apple and how much of the apple to "cut out" to provide a view to the clockworks and show the connection to the clock hands on the surface of the apple. By adding the tick marks for each five minutes I was able to connect the extracted segment to the face of the clock. A challenge, but very rewarding to come up with this design. I'm definitely going to have to try some more of these. I'd love to hear what you think about this new endeavor. 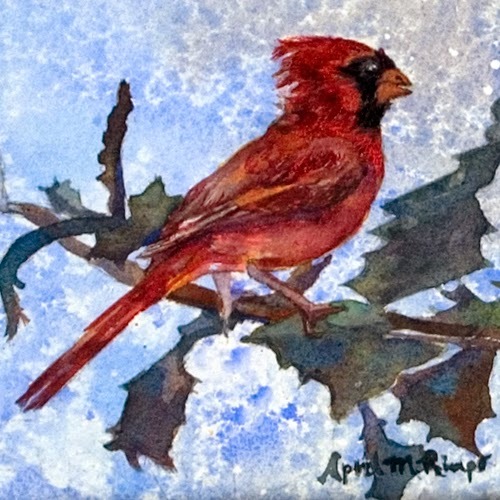 Cardinal in Winter is the fourth in a recent flourish of small bird paintings. The owner of one gallery that represents my art asked if I ever did birds, which I do. Often I paint pigeons. My family seems to have a thing about pigeons. An uncle had a pigeon coop when he was young. When my son was about seven years old we took a trip to Europe. Most days we started out in museums and by afternoon stopped at a park where our son could play with the other children. The language barrier never bothered them. Other days we'd go to a Catheral to see the architecture and amazing art treasures located there. This was in the 1990s and at the time you were encouraged to buy small bags of dried corn and feed the pigeons. We did and my son just loved every moment of it. We have countless pictures of him feeding the birds, them landing on his arm, etc. The glee on his face has resulted in a few paintings. To see my pigeon paintings you might want to look at Pigeons: Evolution of a Series. But I digress. The gallery owner didn't think pigeons would sell in her gallery (I'm grinning since our family's fetish may not be common), but since I have always enjoyed painting pigeons, other birds were a nice diversion. You may recall I shared Chickadee on Day 11 of the Challenge, Morning Song with a Golden Finch on Day 14, and Dove on Day 24. Cardinal in Winter was a fun painting to do. I started with a couple photographs I've take of a female Cardinal in my yard. I combined her with a photograph I had taken of a holly bush one winter and figured out a cropping I thought would be a nice design. Now the poor females a never brightly colored since they need to be well camouflaged when taking care of their eggs and chicks, so I knew I needed to convert her to a male. I had photographs of the males as well and used those for the color reference. You may have noticed I am using paper that was prepared for the yoga series. It was perfect for a sky background in the winter with pale blue and lots of little white spots. I will mount this paper to a 5 X 5" deep cradle Aquabord since I like the presentation of the deep cradle. Once varnished it will be ready to go. Finding images in the abstract underpainting has been great fun. 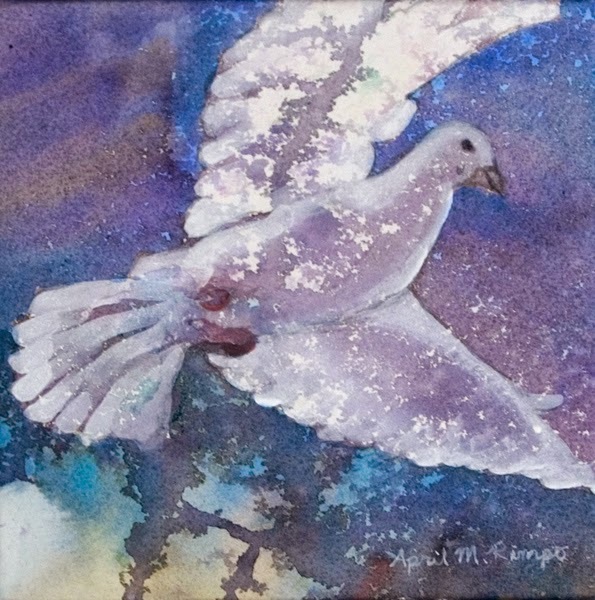 In this case I knew I wanted to paint a dove and looked through various abstract underpaintings I had created until I saw the dove in the white spaces. I wrapped this paper over a stretcher bar and, when dry, I added blues, yellows and white to the primarily violet, gray, and white paper. I loved seeing this dove emerge and fly off into the beautiful sky. Here we are at the last day of my last yoga series. I hope you have enjoyed this series as much as I have. On to different things tomorrow. 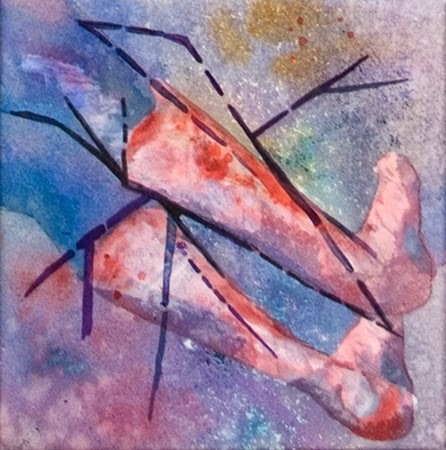 In addition to creating a montage of yoga poses, I have enjoyed this opportunity to explore abstract painting as well as working on my skill at drawing figures from different (foreshortened) angles. It has been a rewarding challenge. I'm sure I'll be able to stretch my style in my more typical paintings by incorporating what I learned from this adventure. The final quadriptych, Awakening, is shown at left. 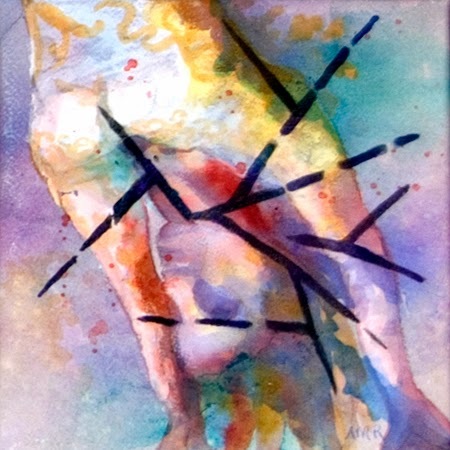 My favorite part of seeing the paintings brought together is to see how the figure appears, whether hidden and mystical or standing out boldly on a sea of stars. If you know the Sun Salutation, then you know there are 12 steps to this salute to the sun, eight of the poses are unique with four repeated once. 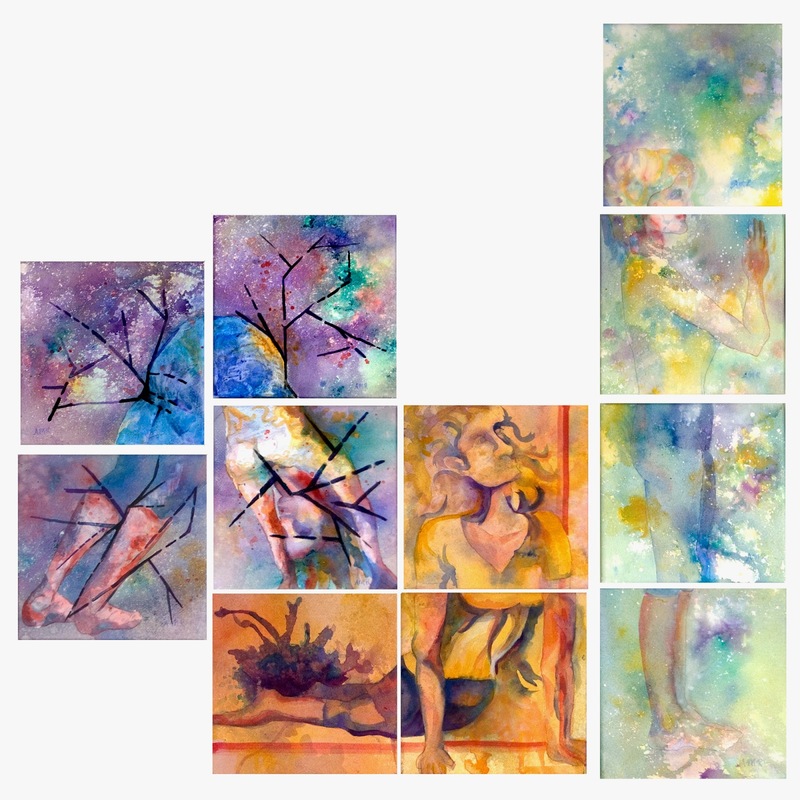 I chose six of the poses that to me captured the primary transitions. My intent was that if all six were displayed together they would be a tribute to the salutation as a whole. My goal in combining several different poses in a single composition is to create a large presentation that holds together as one, yet helps accentuate the individual poses as well. On Day 10 I presented the first three poses together; today I show you the last three poses at the bottom of this post. I'd love to hear your thoughts on the combined presentations. Dimensions as laid out about 35" X 18"
Below is a combined display using the last three poses. The overall size of this three figure composition, titled Rejuvenation, is about 35" X 35"
Here are a couple of quotes related to awakening and some of the ideas I was trying to accomplish in this challenge. Enjoy. Thanks to Leilie Saeta for sponsoring this challenge. Here we are in our last third of the 30 day challenge. Time has flown. My drawing of the pose in this series is quite visible because the pastel-color palette is so pale. As a result I decided not to use any other linework in this painting. Instead I focused on color design to make an interesting abstract that had a consistent whole. "The color green is the color of balance, harmony and growth"
"it is the great balancer of the heart and the emotions, creating equilibrium between the head and the heart." "green is also the color of growth, the color of spring, of renewal and rebirth." "it (green) renews and restores depleted energy. ...restoring us back to a sense of well being." "an emotionally positive color, giving us the ability to love and nurture ourselves and others unconditionally." I love these interpretations and am intrigued by the parallels with the Heart chakra. They give me a whole new meaning to the Sun Salutation and why it ends with this pose. And thanks again to Leilie Saeta for sponsoring this challenge. 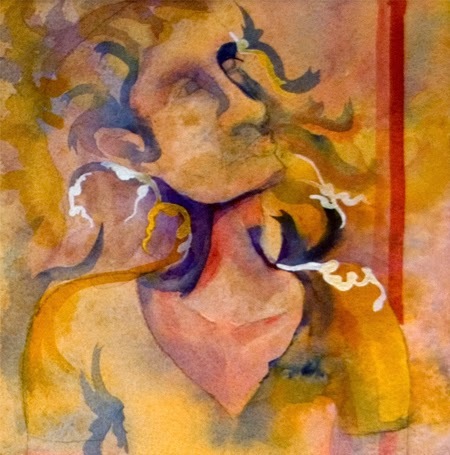 Awakening is the final series I have planned as part of the 30 Paintings in 30 Days Challenge. It will be a 4 day series focusing on the Heart chakra. This does not mean I plan to stop at painting 23, I'll simple move on to different subject matter. The Heart chakra is characterized by the color green. So like my other yoga pose series I started by painting a large sheet of paper with a variety of textures using primarily greens with some blue, yellow and violet. The image of the full sheet is shown here. I left windows of white that I could place strategically for the various parts of the pose. 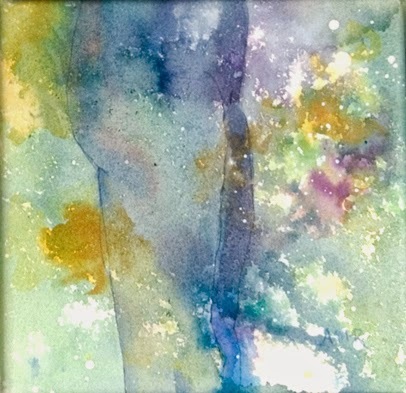 There were also tiny white dots all over the sheet which became star-like in these paintings. I actually love how much each painting ended up looking like staring out into space. 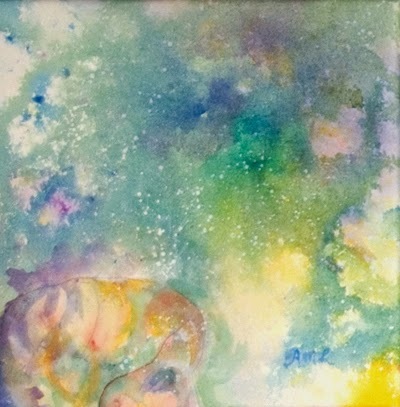 While adding more colors and forming the people, I intentionally left the appearance of outer space since that is what made each small abstract work for me. The full sheet was about 50" by 30", which I divided into 13" square segments and gallery wrapped 8" X 8" stretcher bars. Having these as a starting point for my series ensured I would have more than four options to use for the paintings. The meanings associated with the Heart chakra are love, compassion, acceptance, awakening, and trust. Kadinsky's interpretation of green was not dissimilar; it was peaceful with inner strength. The musical tone he associated with green was the middle-position violin. I wish I knew more violin music and could name a piece that fits with this series. Any suggestions? Final day for the Devotion series. At left is the fourth panel. This panel was the only part of the figure that had none of the blue pants, so I made sure to add a variety of blues in other areas to make all four panels balanced and feel like one when brought together into the quadriptych. I really enjoyed working with violet in this series. Violet and yellow look great together, but can turn to ugly "mud" colors if you aren't careful to let them dry before applying them next to or on top of each other. Below you can see the full four panel painting Devotion. This yoga pose, Downward Facing Dog, has always looked a bit like bowing down, so it really fit in with the overall color of the chakra and the many interpretations of violet and purple that I found (as discussed in the Day 16 blog post. Now that you see the whole pose you see what appeared in Day 16 and 17 to be a bit like the earth and outer space, was really her "bottom". Many of the lines suddenly outline parts of her form and are not just random, but I must say I loved the interpretations that everyone had for the lines in previous posts. They made me feel like I was definitely succeeding in making each segment an interesting painting while still communicate the broader theme. Thank you for the positive feedback. Dimensions as laid out about 20" X 17"
The line work is an important element in this series. I want the lines to form an interesting pattern on their own while tying together the other elements of the painting. 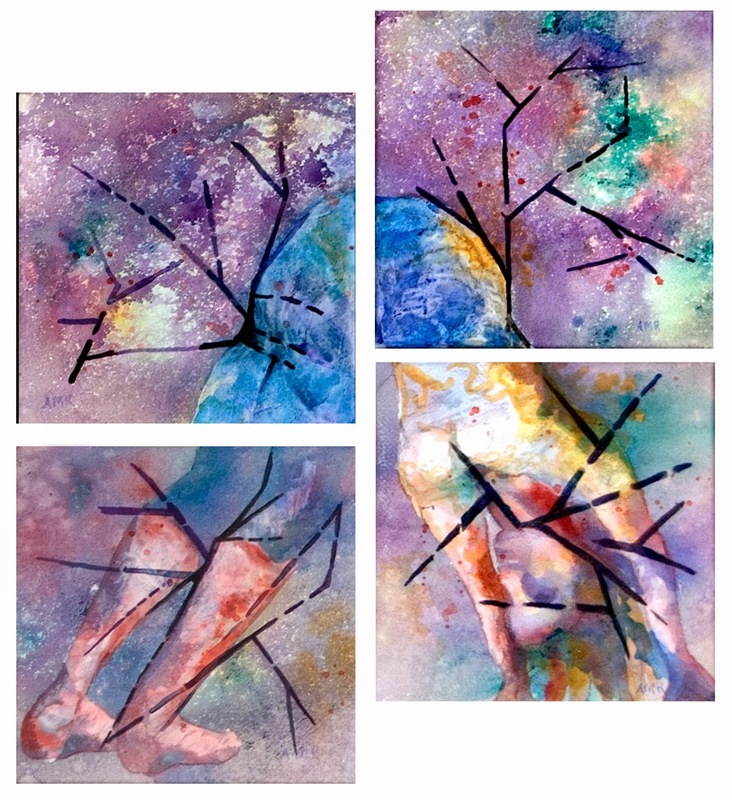 When the four paintings are compiled into a quadriptych these lines need to work together, so I spent some time designing them. Since I am working in fluid acrylics you can't apply them then take them off and put them somewhere else. I took a clear sheet of acetate and placed it over the paintings and tried out some different line patterns. Since acetate is slick I could just wipe off what did not work until I was happy with the design. If you paint with transparent pigments and you don't own any clear acetate I highly encourage you get some. You can get these at a variety of sources, I believe I got mine from Cheap Joe's Art Stuff (Team Plastics Polyester Film). They are available in a variety of sizes. I bought the largest size, 20" X 25" so they would cover a large area at once. Yesterday I promised to reveal the meanings related to the chakra associated with violet. This chakra is stimulated in "the third eye" which is the center of the forehead. I found various meanings, including clairvoyance, psychic senses, selflessness, and devotion. Rather than sharing more of my thinking, I'd like to hear what you see and feel when looking at this painting. Ah, those calming colors are back with an emphasis on violet in this new Devotion series. 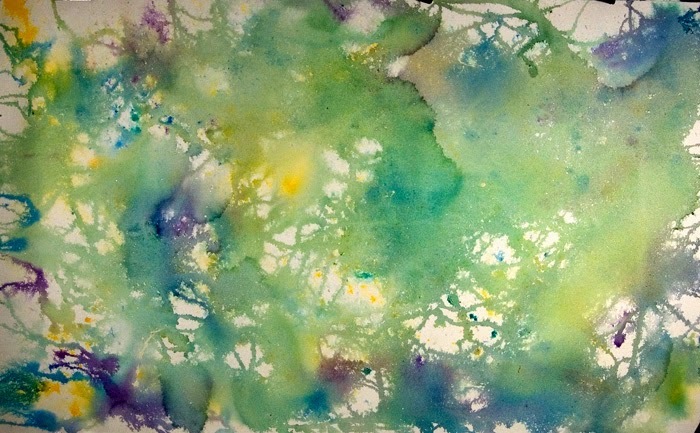 These cool colors make me think of the atmosphere around the earth and I start to see stars. As I was painting I thought a lot about that and I suspect some of that is communicated in the finished painting. 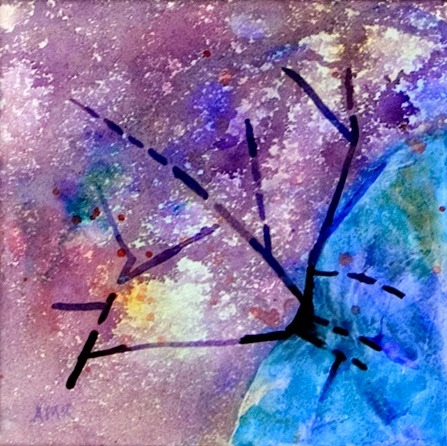 Violet "stimulates the imagination and inspires high ideals"
"It is an introspective color that allows us to get in touch with our deeper thoughts"
As a blend of red and blue, purple and violet "contain the energy and strength of red with the spirituality and integrity of blue. 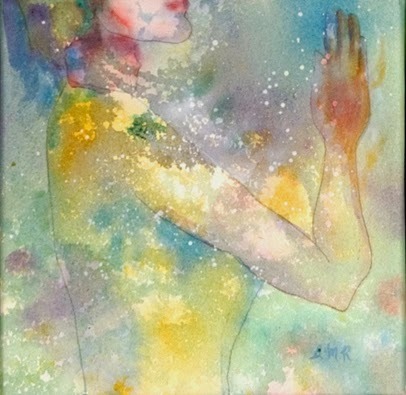 This is the union of body and soul creating a balance between our physical and our spiritual energies." 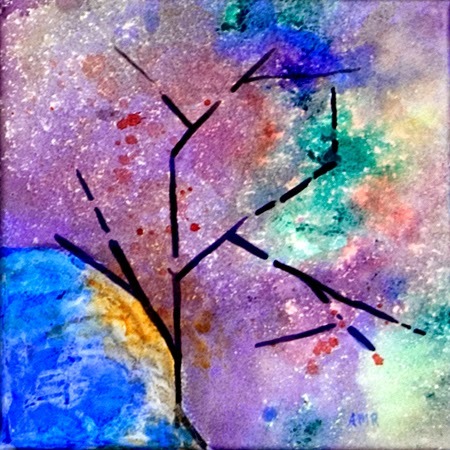 "Purple or violet assists those who seek the meaning of life and spiritual fulfillment - it expands our awareness, connecting us to a higher consciousness. For this reason it is associated with transformation of the soul"
Tomorrow I'll reveal the meanings related to the chakra associated with violet. It turns out the Kadinsky source I was using was silent on the colors violet and purple. 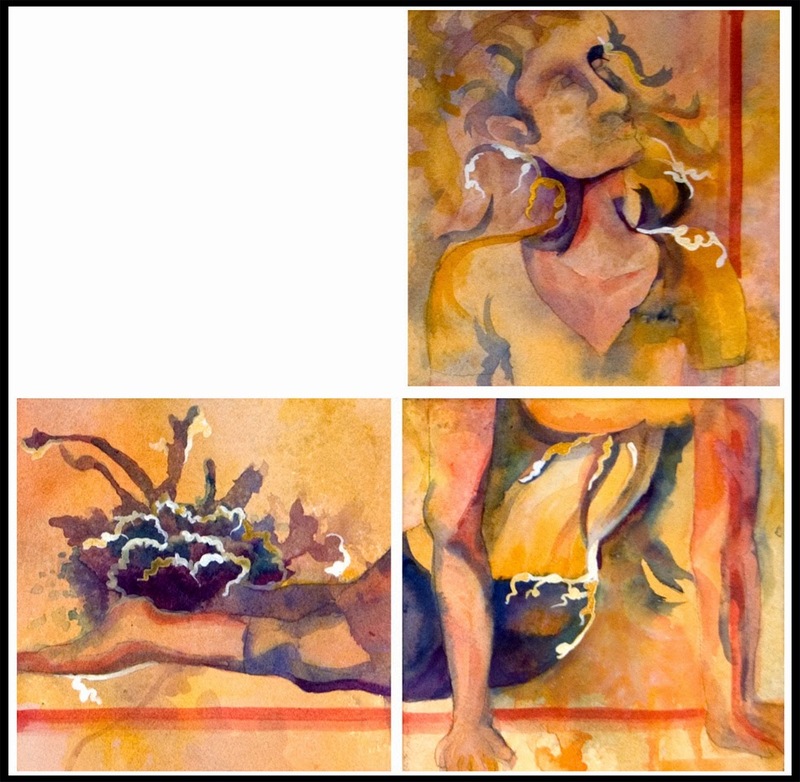 Half way through the challenge and here is the completion of my triptych Energy. The composite painting is pose seven in Sun Salutation, the Cobra. I've learned the breathing exercise in this pose activates the sacral chakra (energy center) between the belly button and pelvis. Some sources associate this chakra with yellows and other with orange. I decided to focus on yellow and include some orange colors as well. The breathing exercise in this pose is said to radiate personal power, self esteem, willfulness, and energy. 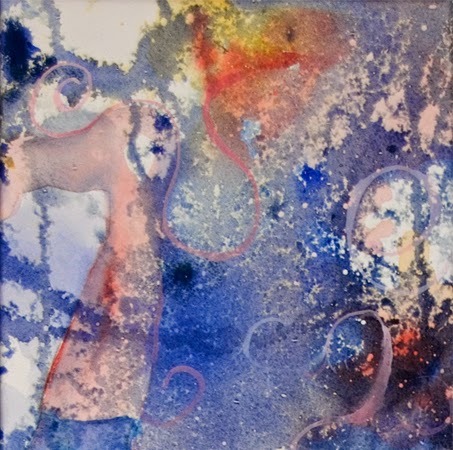 My goal was for my paintings to issue forth a sense of personal power and energy. Dimensions as laid out about 17" X 17"
Surprise! 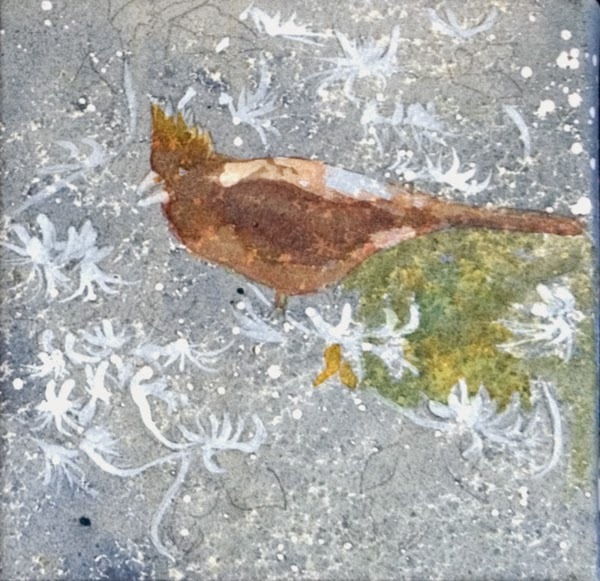 Yesterday I said I would be wrapping up the Energy triptych today, but I felt more like painting a little bird again, so I bring you Morning Song. Like the Chickadee I produced for Day 11, the Golden Finch is another bird that frequents our yard year long. In the spring the yellow of he males nearly vibrates with color. It clearly screams out "notice me!" 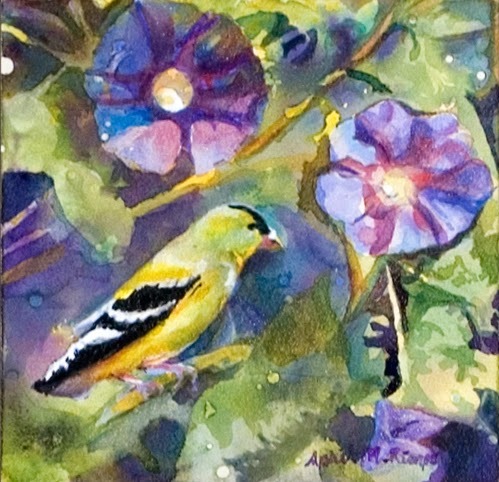 About the same time the finches reach the peak of their color our morning glories begin to bloom. What a glorious time Spring is. I wish it were here. 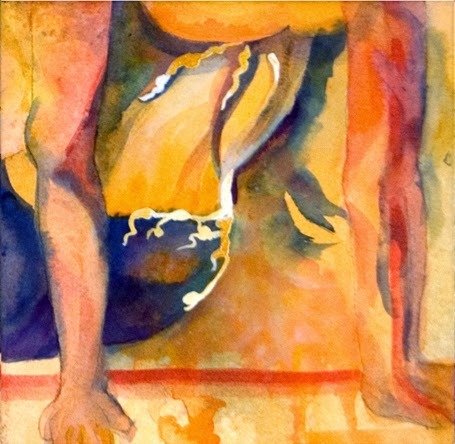 See all the art in Leslie Saeta's 30 Paintings in 30 Days Challenge. Second painting of the triptych Energy. The primary color in this triptych is yellow. The only meaning I found associated with chakra (energy center) associated with yellow is energy. Kadinsky, of course, had more to say about yellow. First of all he heard a fanfare of trumpets. I find that analogy interesting. I think of trumpets as announcing the day or starting a celebration, both energetic moments. The meanings Kadinsky associated with yellow are warm, exciting, disturbing, or totally bonkers. My goal in portraying these "Sun Salutation" poses is certainly not intended to make anyone feel disturbed or totally bonkers, so I hope this painting makes you fee either warmth or excitement. Tomorrow I'll share the final segment and full image of the triptych. Energy is the name of this new series. I thought I would start with some quotes about energy from different perspectives. ART - Sir Kenneth Clark, "Energy is eternal delight; and from the earliest times human beings have tried to imprison it in some durable hieroglyphic. It is perhaps the first of all the subjects of art." It always fun for me to look at my paintings with fresh eyes ignoring my original intent. I find I can do this when looking at a photograph of the painting, but not when looking at the original. Maybe this is like looking at a painting in the mirror; it helps me separate myself and be more objective. 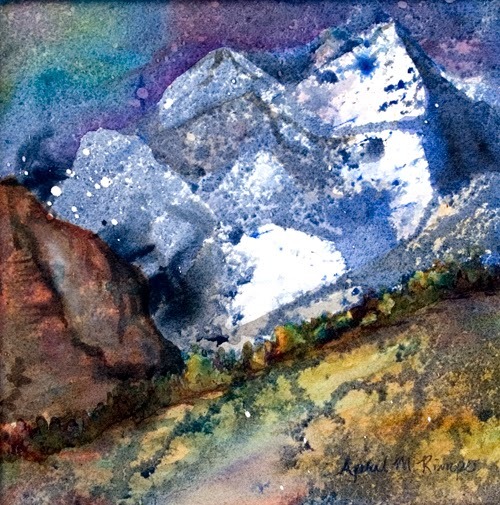 In Energy Part I I see stormy clouds over a landscape of receding mountains. I guess the UNIVERSE quote fits best with what I am seeing. What do you see? Switching it up for Sunday. I decided to go with something different today. We are lucky to have a number of little birds that visit our bird feeder throughout the year. 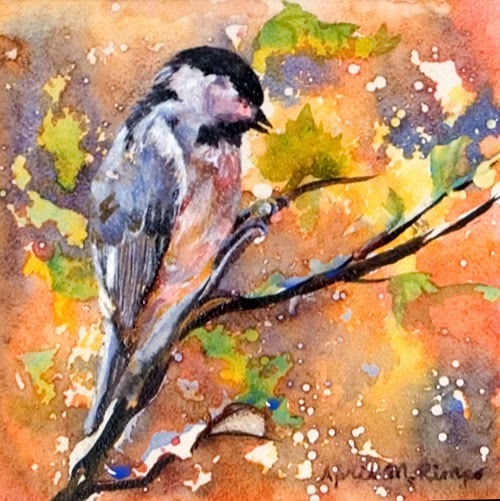 The Chickadee is a regular year round. I've loved these little guys since I was a child in Massachusetts and am happy to have them here in Maryland as well. This little guy is holding a seed and about to peck it. I enjoy working on these deep cradle platforms since after varnishing the painting is ready to go. 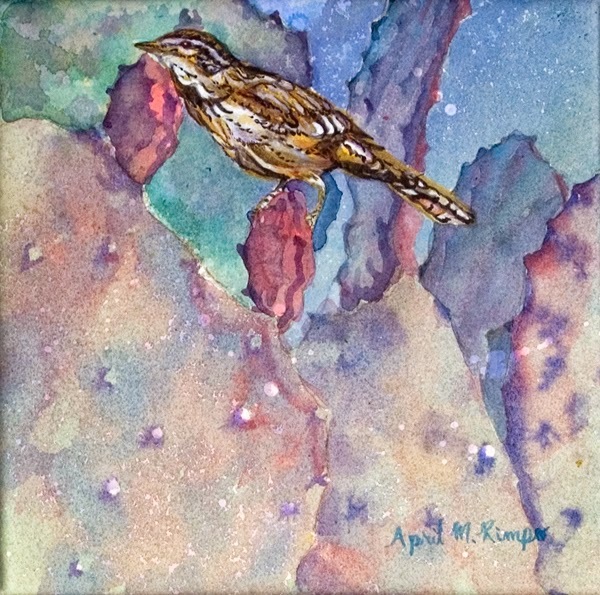 View some of my other bird paintings here. 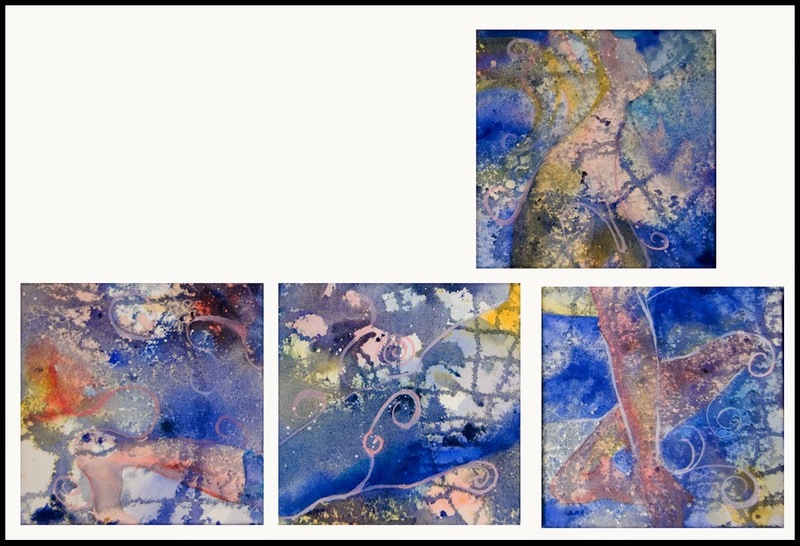 Perception IV finishes up the quadriptych, which is shown below the image of the fourth panel. When I first looked at Perception IV (above) I saw a triangle with a flag on top. Not my goal, so like the Day 9 painting I added some "galaxy swirls" and the triangle seemed to receed into the background. I am always fascinated how such a simple change can alter how some other part of the painting looks. I did nothing to actually mute or alter the triangular shape. I wonder how many other shapes people might see in these paintings. Taking another look at my own paintings, I now see musical notes on a staff in the middle bottom painting in the image below. What do you see? Looking at the full composition below, you might notice that the panel above is oriented in a different direction compared to the complete Perception quadriptych. In fact the panel on the lower right was also rotated in the Day 9 post. 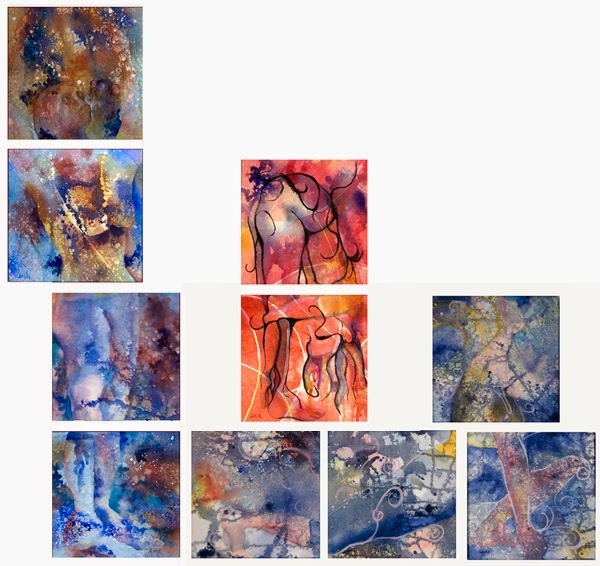 I wanted to make the point that the individual abstracts can be hung in whatever orientation you like. You are not bound to hang them to form the figure in the forward lunge pose. I'm actually starting to think it might not be a bad idea to turn the panels in different directions when I paint them so I don't get too hung up on the figure. Dimensions as laid out above 17" X 25"
In an earlier post I mentioned combining poses to create a larger composition. Here is one example how the first three poses could be combined. This montage is called Beginnings.